Parliament held public hearings on the Amendment Revenue Laws Bill, also known as the Health Promotion Levy on Sugar Sweetened Beverages on 31 May 2017. In 2016, the Minister of Finance announced that there will be a tax on sugar sweetened beverages. Following the Minister’s policy statement/ announcement in February 2016, National Treasury published the Policy Paper on Taxation of Sugar Sweetened Beverages in July 2016 inviting comments from the public. The sugar tax was set to be implemented by April 2017. Initially, a joint committee meeting was held between the Standing Committee on Finance and the Portfolio Committee on Health in February 2017 at Parliament. At that stage, there was technically no draft Bill before Parliament and merely an opportunity for the committees to familiarise themselves on the issues related to the proposed sugar tax. No decisions were taken at that meeting. 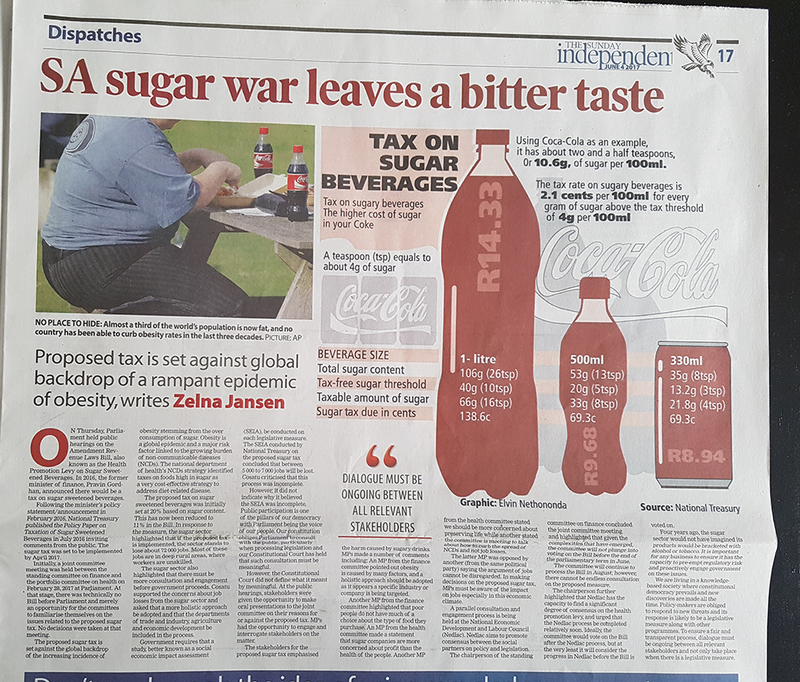 The proposed sugar tax is set against the global backdrop of the increasing incidence of obesity stemming from the overconsumption of sugar. Obesity is a global epidemic and a major risk factor linked to the growing burden of non-communicable diseases (NCDs). The National Department of Health’s NCDs Strategy identified taxes on foods high in sugar as a very cost-effective strategy to address diet-related disease. The proposed tax on sugar sweetened beverages was initially set at 20% based on sugar content. This has now been reduced to 11% in the draft Bill. Non-sweetened fruit juices and unsweetened milk products are excluded from the proposed tax. In response to the measure, the sugar sector highlighted that if the proposed tax is implemented, the sector stands to lose about 72 000 jobs. Most of these jobs are in deep rural areas, where workers are unskilled. The sugar sector also highlighted that there must be more consultation and engagement before government proceeds with the proposed tax. Cosatu supported the concerns about job losses from the sugar sector and asked that a more holistic approach be adopted and that the Departments of: Trade and Industry; Agriculture; and Economic Development be included in the process of finalising the legislative measure. Government requires that a study, better known as Social Economic Impact Assessment (SEIA), be conducted on each legislative measure. The SEIA conducted by National Treasury on the proposed sugar tax concluded that between 5 000 to 7 000 jobs will be lost. Cosatu criticised that this process was incomplete. However, it did not indicate why it believed the SEIA was incomplete. Public participation is one of the pillars of our democracy with Parliament being the voice of our people. Our Constitution obliges Parliament to consult with the public, particularly when processing legislation and our Constitutional Court has held that such consultation must be meaningful. However, the Constitutional Court did not define what it meant by meaningful. At the public hearings, stakeholders were given the opportunity to make oral presentations to the joint committee on their reasons for or against the proposed tax. Members of Parliament (MPs) had the opportunity to engage and interrogate stakeholders on the matter. The stakeholders for the proposed sugar tax emphasised the harm caused by sugary drinks. MPs made a number of comments including: An MP from the Finance committee pointed out that obesity is caused by many factors, and that a holistic approach should be adopted as it appears that a specific industry or company is being targeted. Another MP from the Finance committee highlighted that poor people do not have much of a choice about the type of food they purchase. An MP from the Health committee made a statement that sugar companies are more concerned about profit than the health of the people. Another MP from the Health committee stated that we should be more concerned about preserving life whilst another stated that the committee is meeting to talk about how to curb the spread of non-communicable diseases and not job losses. The latter MP was opposed by another (from the same political party) saying that the argument of jobs cannot be disregarded. In making decisions on the proposed sugar tax, MPs must be aware of the impact on jobs especially in this economic climate. A parallel consultation and engagement process is being held at the National Economic Development and Labour Council (Nedlac). Nedlac aims to promote consensus between the social partners on policy and legislation. The Chairperson to the Standing Committee on Finance concluded the joint committee meeting and highlighted that given the complexities that have emerged, the committee will not plunge into voting on the Bill before the end of the parliamentary term in June. The committee will continue to process the Bill in August; however, there cannot be endless consultation on the proposed measure. The Chairperson further highlighted that NEDLAC has the capacity to find a significant degree of consensus on the health promotion levy, and urged that the NEDLAC process be completed relatively soon. Ideally, the committee would vote on the Bill after the NEDLAC process, but at the very least it will consider the progress in NEDLAC before the Bill is voted on. I would venture to say that four years ago, the sugar sector would not have imagined that its products would be placed in the same slide as alcohol or tobacco. It is important for any business to ensure that it has the capacity to pre-empt regulatory risk and proactively engage government on these issues. We are living in a knowledge-based society where constitutional democracy prevails and new discoveries are made all the time. Policy-makers are obliged to respond to new threats and its response is likely to be a legislative measure along with other programmes. To ensure a fair and transparent process, dialogue must be ongoing between all relevant stakeholders and not only take place when there is a legislative measure.